Racing week. 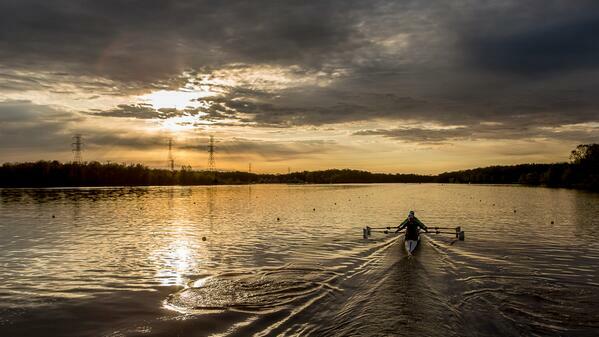 The 2014 National Selection Regatta II begins in less than two days. As with any big regatta, there’s excitement, anxiety, and a specific focus that comes from knowing that you’ve put in hours upon hours of hard work, pounded yourself on the water and in the weight room, cried in frustration and celebrated in the small victories all for this: racing week. For Ellen and me along with nine other boats entered in the women’s double sculls event, the week will consist of three races: a time trial on Thursday morning, Friday semifinal, and Saturday final. That is roughly 21-22 minutes of total racing. Room for error doesn’t exactly exist in rowing. You don’t have nine innings to “sort things out” or four quarters to “get the momentum back.” Every stroke and every second matters in a 2,000-meter race. Excitement, anxiety, focus. In the women’s double event, the time trial will determine seeding for two semifinals of five boats with the top three advancing to the A Final, bottom two to the B Final. Obviously, the goal for any boat entered is to win. With a win, comes the opportunity to represent the United States and compete at a World Cup in order to hopefully qualify for the World Championships, securing a spot on the 2014 National Team. Other boats competing at NSR II include the men’s double sculls, men’s pair, men’s lightweight double sculls, and women’s lightweight double sculls. In less than 48 hours, forty-four crews representing 14 clubs will converge upon the waters of Mercer Lake in West Windsor, New Jersey to duke it out. The field is stacked with a plethora of Olympians and multi-time national team members and promises to be some fast and competitive racing. 2014 National Selection Regatta II racing schedule and results can be found HERE. Good luck Mego! Wish I could be there to see you race – one of these days! Will be following online and cheering for you from Connecticut!